Star Citizen's latest video is pure space sim. Assembled for a recent presentation of developments in AMD graphics technology, the footage does more than show off all the polish that's being applied to the ambitious project. The video also works as a subtle vehicle for the highly-anticipated game's story. We've seen some of the footage before, but the new video begins to demonstrate the world-building that's going on behind the scenes of developer Cloud Imperium Games' extremely well-supported Kickstarter project. There are shots of various ship classes, including the Aurora and the 300i which we've known about for a while now. 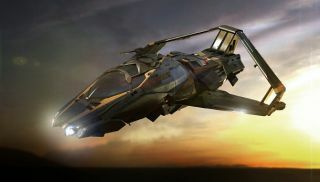 But we also get a look at the heavily-armed Vanduul Scythe raider, apparently a popular target of Star Citizen's human pilots. But for me, it's the sense of perspective in the video that makes it work as a "sizzle" reel for the game. When space sims function well, a player gets to feel as if he or she inhabits the role of a starship pilot. Seeing how Star Citizen stitches together its various approaches to the idea of a space sim—a hanger, a profile of a space port, or a Vanduul ambush in an asteroid field—adds some weight to whatever narrative that will end up emerging from the game's universe when its pilots step out of the cockpit.